- eat-in kitchen with lots of counter space, appliances, fully stocked with cookware, dishes, etc. - sleeps 7: 2 in a double bed, 2 in a queen, 2 on queen sofabed, and 1 on the couch. - a storage room for all of your "stuff"
- Marble Lake Road runs along the shoreline in front of the cottage. - The shoreline is approx 75 feet in front of the cottage offering direct access to the lake, boat launch, sandy beach, and beautiful views. - The cottage is next to a family-oriented campground called Twin Cedars, and Marble Lake Lodge (store & restaurant) is just down the road. - The water is drinkable but has iron in it, so a water cooler with filled jugs are provided. - Bring your own sheets and towels. Warm blankets and pillows provided. Pillows have waterproof covers on them. $500 damage deposit must be received 30 days prior to arrival. Signed cottage rental agreement required - signatories must be over 18. 10 minutes drive from Bon Echo Provincial Park, Marble Lake is a good sized lake offering fishing, boating, swimming, and all sorts of water activities. It is connected to other lakes and a popular area for canoeing. Nearby is the village of Cloyne which boasts a General Store, gas station, hardware store, laundromat, outdoors store, tennis court, church, golf course, restaurants, post office, and more. Rates for longer stays and reservation extensions considered on an individual basis. $500 damage deposit must be received 30 days prior to booking. PLEASE DO: enjoy using the cottage, it's contents, piano, deck, BBQ, wood stove, fire pit, phone, invite day-visitors, leave the cottage the way you found it (clean up after yourself), replace or let us know of anything you've broken. PLEASE DON'T: smoke, allow pets on the furniture and beds, let the water run excessively, flush foreign objects down toilet, leave a mess or excess garbage, leave food in the fridge, use fire pit during a fire ban, walk through cottage with messy footwear, let unpaid guests stay overnight, etc. Everything we needed was available from all the kitchen utensils, pots and pans, to music, games and books. The cottage was very clean and very well maintained. There were loads of blankets and pillows. The beds were comfortable. There was lots of space in the cottage. We were a short drive some great hiking trails in Bon Echo Park and a short drive to groceries for the few things we forgot. We were there in early November and it was VERY quiet in the area, which was just what we were looking for. 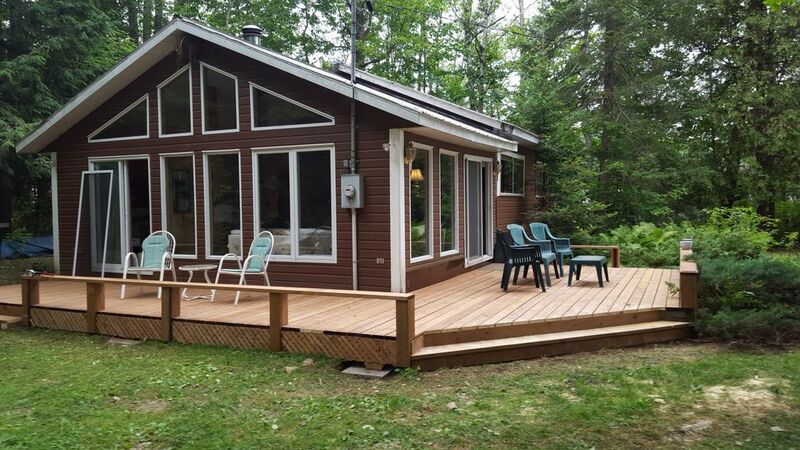 We had a great weekend and would not hesitate to go back to Marble Lake Cottage again. We were a group of 4 adults and 1almost teenager. We found the cottage comfortable, with enough sleeping room for all of us. David was very accessible, and even sent us a detailed text on how to use the wood stove at short notice. We are grateful to him for making the stay so comfortable. Bon Echo is only 10 minutes drive from here and there’s a great diner (Marble Lake Lodge) close by, making it an excellent location. We hope to repeat our stay. Charming comfortable well equipped cottage. Nice location, easy access to the lake. Owner is very nice and easy to work with. Minimum 2 night stay $500 damage deposit must be received 30 days prior to arrival. Signed cottage rental agreement required - signatories must be over 18.